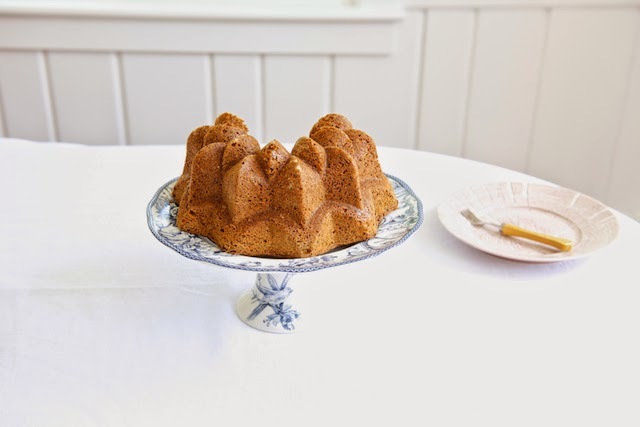 Poppy Seed Lemon Chiffon Cake Revisited! April 10, 2010 didn't even mark the six month anniversary of my writing and photographing here. That is when I first shared this Poppy Seed Lemon Chiffon cake. I found the recipe in a cookbook Jonathan possessed, when I met him when he was only twenty while studying in Israel. The cookbook was one of his very few belongings. I have baked this cake ever since. It's now a part of our twenty-two year old son's canvas of childhood memories. Now that S, our son, is almost done with college, and is back home for a bit, I baked this cake for old times sake. Even if he's on a low carb diet as a part of a lifting, intervals, recreational sports exercise routine with a daily protein shake. I am such a temptress! A bad, bad influence! My favorite image out of the three. I like the descending vantage point. In the post from 2010 I wrote about J's baby blue retro jacket and the origin of this recipe. Little did I know that some of my story telling and recipes would be published along with my newly found passion, my photography, in various publications. Along the way, almost six years later, I learned how to keep short form writing really tight. I am yet to venture into long form. I find it excruciatingly difficult. I learned about recipe writing (and still learning) and discovered that I've got an artistic eye and love for photography. As you can see from my 2010 post, at the time I was using an old, even for 2010, point and shoot. I graduated to a cropped sensor Nikon DSLR and eventually took the plunge last year and bought a new full frame sensor Nikon. Typically I do not re-shoot old recipes. I like the documented progress on Food Wanderings, but I make this cake so often and felt that some tweaks in the directions were inevitably necessary. 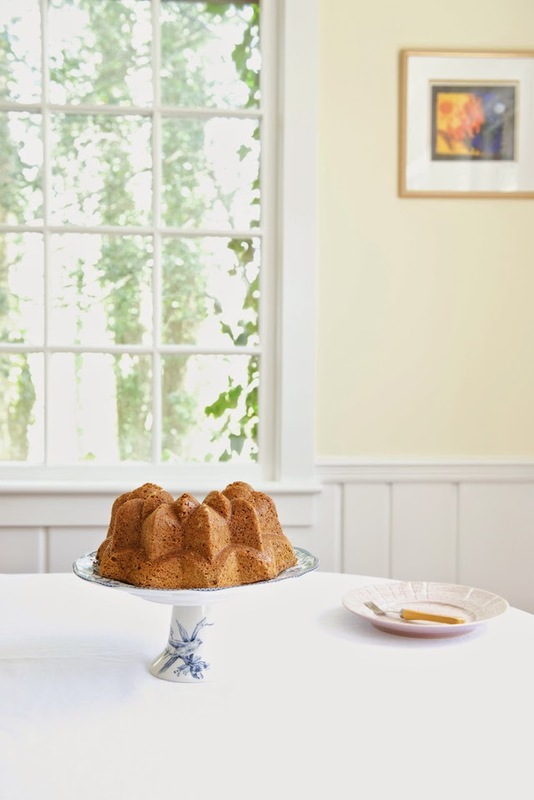 Beautiful light was streaming into the dining room so I re-shot even though the cake was partially devoured. During the fall and winter seasons I bake this cake with apples and orange juice instead of lemon and poppy seeds. It is a tad daring given it's a chiffon, it bakes ten minutes longer but it works. This time I used a kugelhopf pan that I bought years ago but never put to use. I feared all the nooks and crannies would be traps when I try to 'dislodge' the cake, but to my surprise it went without ANY incidents. Who would have thought it would be, perfection?! Which brings me to, not only ovens vary and affect baking time, but also different type of pans conduct heat differently. Varying pans will affect the length of baking, the 'dislodge' of the cake as I call it and even the texture of the exterior and interior of the cake. This particular kukelhopf bundt pan was surprisingly super effective. I could have easily shaved 5 minutes off the baking time, from fifty minutes to forty-five. Having all ingredients, pans and bowls ready makes making this cake very fluid and meditative. Preheat the oven to 350F. On regular not convection setting. Soak the poppy seeds in the warm milk and set aside. In a mixer with a whisk attachment, beat the egg whites on medium speed for 3 minutes until they gain some volume and are foamy. Gradually add the 1/2 cup of sugar while turning up the speed to medium high. Beat for 3 minutes longer. Turn the speed to high for another 2-3 minutes until the meringue has peaked and is sturdy. Scoop the meringue with a rubber spatula into a large bowl, cover with plastic wrap and keep refrigerated. Note: Do not over beat the egg whites beyond 9 minutes at most, otherwise the meringue will collapse from overheating. In the same mixer bowl with the whisk attachment, no need to wash, add the egg yolks, 3/4 cup sugar, pinch of salt, vanilla, lemon juice and zest and beat for 2 minutes on medium high speed. Add the oil in a stream, while continuously beating, for approximately 3 minutes longer or until the egg yolks are pale yellow and fluffy. In a separate bowl mix both flours with the baking powder. Butter the bundt pan, sprinkle it with some flour and tap it upside down, over the sink, to rid it of any excess flour. With a rubber spatula gently fold the egg whites into the egg yolks until mixed well. Add the flour mix and poppy seed/milk mixture in batches, alternating the flour and poppy/milk mixtures while continuously folding gently until incorporated well into the airy, voluminous batter. Pour the batter into the greased and floured kugelhopf or bundt cake pan and bake for 50-60 minutes. Do not open the oven mid-way through. The cake will collapse if you do. Insert a skewer at the 45 minute mark. If the skewer comes out crumb free and clean, then the cake is ready. Let the cake completely cool down before gently releasing the edges with a knife and inverting into a serving cake plate or a cake stand. Once inverted, dust with some confectioners sugar (if you wish) or glaze the cake with a lemon glaze found here. Do not dust or glaze when the cake is still warm or hot. Such a beautiful cake, and I love the photos! Your photos are gorgeous. I sometimes reshoot old photos but I keep the old ones there too. It is a nice way to see how far I've come. This cake sounds wonderful. beautiful photo anon I love the flavors of this cake! I bet the fall version with apples and orange juice is just as wonderful!! 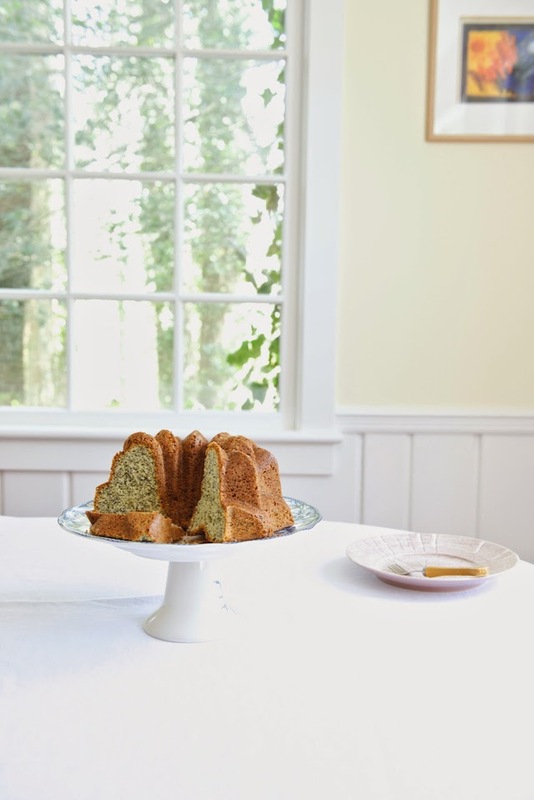 Such a beautiful cake and photos - and lemon poppy is one of my all-time favorite flavor pairings in baked goods. I can totally understand why you make the recipe so often! Gorgeous photos! The cake sounds perfect. I'm impressed to know that you put apples in a chiffon cake and it works. I'm not sure I'd be brave enough to try that without knowing of your success. This sounds lovely, definitey worth revisiting. Your photography of this cake is stunning. I really like the half eaten look. And in your room that is flooded with light, it makes me want to step into your photo, relax and have a piece of your delicious cake! I love reading all of the memories that this cake brings up. Gorgeous photos, too!